Hegemony…is the perspective of the dominant culture, race, or group, as if it were the only perspective–everyone else needs to get on board. Hegemony is blind to the notion that we–you and I, perhaps most especially when we are divergent–are in this together. We each have distinctive points of view. Together, we can have a wide-angle outlook [that we need]. V. Bassford Lord, I love the Church and We Need Help, page 35. One of the newest developments in the Call To Action conversation is that the pastors of the largest churches sent an open letter to General Conference delegates. It’s nice. It talks about the death tsunami and the coming doom and gloom of the UMC, the inefficiency of the General Boards, and the graying of the clergy. It asserts a need for organizational change so that the church can be focused on nurturing vital congregations. All boilerplate CTA stuff but worded in a way that even my skeptical young clergy friends are signing it. But as I was reading Bassford’s book, that quote jumped out at me as I read the original signatories to this open letter, purportedly the pastors of the largest churches in the UMC. “Hegemony” means a dominant group that thinks alike. Now, each of these churches has grown and they meet regularly to learn from each other how to continue growing, so they clearly think of their churches in similar ways (at least on a spectrum, they would be together). And that’s fine, we want our churches to grow and it is great to learn from leaders that have grown their churches effectively. I don’t mind this hegemony group. But as I read the signatories, I began to wonder if there was a regional hegemony as well in the Call To Action. So the Southern jurisdictions have nearly 5x the number of crafters to the letter than the other regions combined. That immediately put up a red flag for me. It becomes very difficult to not be disturbed when the recommendations coming from these churches represent the population density but not the vast diversity of the United Methodist Church. Northeast Jurisdiction ratio (3:114) = 1 signatory for every 38 votes. Western Jurisdiction ratio (2:32) = 1 signatory for every 16 votes. North Central ratio (10:112) = 1 signatory for every 11.2 votes. South Central and South Eastern ratio (72:400) = 1 signatory for every 5.5 votes. So the signatories and pastoral leadership of the Open Letter are overwhelmingly (a) large churches (b) Southern churches and (c) disproportionate in voice to their population in the UMC. Like No Child Left Behind, the Call To Action is supported by those churches that will seem to benefit the most by lower apportionments and less “official” resources to compete with the sales of their regional resources (ie. Hamilton’s resources, Mike Slaughter’s resources, etc). We’ve seen in the responses from the African Students and the Ethnic Caucuses that the reorganization plans are not on the line with ministry to these groups, and indeed take some money from these mission fields. It really doesn’t matter if we map this trend out. Because no matter what we say or do, the Southern jurisdictions will prevail on this issue. UPDATE: Jared below mentioned that I didn’t have the central conferences in my numbers, so the above has been updated to reflect that. Thanks Jared! The Call to Action is supported by and will be crafted by a Hegemony of large Southern churches. I don’t want to get into regionalism here, as for my entire ordained life I’ve been a part of the South Central Jurisdiction, and I don’t want to get into criticism of successful churches. I’ve been a part of both. Areas which have grown are again under-represented. Some of the growing conferences have had their delegations reduced. Whenever an area is under-represented it threatens the legitimacy and support of the connection. We needed to represent more fairly and strongly the vision of the growing and vital areas of the church. Each General Conference of the last three has affirmed that we need to hear the voices of Africa and the growing conferences of the United States. In my opinion, if we are to avoid becoming a sectarian church with a power base in the South, then we need to legitimize the mission field voices. We cannot just reward success with more representation: they already have that. The Southern Jurisdictions can have their way with anything in the UMC with only a modicum of support from the global church. Instead, why aren’t we valuing the voices from the margins, from the extremes, from the areas of the country where slow growth is the norm? The creeping secularism will reach the South one day, and if they do not empower the churches already in this culture to deal with it now, then the South will be under-equipped to deal with it later. As Bassford says, “we each have distinctive points of view. Together, we can have a wide-angle outlook.” We can weather this storm together, but only if the hegemony opens itself to its role of guidance, not dominance, in the global church. If we want a Solution that furthers the growth of the UMC so it becomes a regionalized Church like the Southern Baptist Church, then the Call to Action is clearly a step in that direction. If we want a Solution that welcomes and listens to the voices of the Church on the mission fields, the bleeding edges of the Church, the Diaspora, the Frontier, then the Call To Action does not honor those voices or grant them voice of any consequence at the table. I don’t want to see our church go the way of the Southern Baptist Church that became a regionalized center of influence that became more and more insular to the point that their hegemony took over the SBC and removed the women and progressive voices. I fear that moment may be upon the United Methodist Church as it seeks to be the church that began with “the world is my parish” and ended with “the world is my parish, but only the South and Africa are really important.” May it not be so with our beloved United Methodist Church. The CTA is clearly a call to power and not a call to where the Holy Spirit is moving and inspiring and working for the transformation of the world. Thank you for the clarity of this article (and especially the map for us visual learners). If the voice of the powerful is the only voice (or the only 15 voices) we hear and heed, then we are not listening where we ought. A solid post as always Jeremy. A system absorbed in it’s own anxiety will always seek to stifle voices that seem outside the “norm”. I can’t help but notice how what is happening in our own Jurisdiction is a microchasm of this effect. Minority views or approaches are completely overwhelmed by Texas. We elect Texas Bishops and focus resources there as well. The Hegemony declares: Dallas and Ft. Worth each need a Bishop, but soon Kansas and Nebraska will share a single Bishop (statistically speaking, who will be from Texas). At the same time these conferences lost more delegate votes proportionally and will have less voice in the face of future changes. I think your evaluation is appropriate and interesting; however, I think your evaluation would be more effective if you showed population density on the map. I agree. However, my technical skills are limited regarding Google Maps, so I just went with what was most efficient in presenting the primary points of the post. Jeremy, lots to think about here, thanks. One immediate thought is that delegates self-select their committees. So an important question might be why did the Northern and Western Jurisdictional delegates themselves prioritize other committees over the one that will deal with restructuring? Is it because they already feel disenfranchised from the general agencies? What are they choosing to work on instead? It is a little surprising to me that GA only has 54 people. I am on Higher Ed and Ministry which has almost 90, overwhelmingly clergy, members. Guess people were originally more worried about “security of appointment” than the restructure. Amy, terrific question, thanks for it. I do think that people were originally more worried about other issues than the restructure, and had to choose their committees before this became a flashpoint. And there’s plenty of pressure: when an AC has only two delegates, what place is of most important to their conference becomes a much bigger decision than the larger conferences who can cover each committee easily. Can we blame the self-selection? Sure. But there’s a privilege that larger ACs have over the smaller ACs that I really can’t blame them for what they chose to focus on. The (Methodist Episcopal) South will rise again!!! ps. How did you write an entire post without referencing our predecessor denominations?? Thanks as always for your analysis. I agree with your direction, but I think you leave something else. The numbers you have don’t seem to reflect the Central Conference delegates who will be on the committee. My latest roster indicates that there will be 54 delegates from the US, but you seem to be missing the 23 delegates that are coming from the Central Conferences. There are 1 from Central Congo, 2 from Cote’ D’Ivoire, 1 from East Africa, 1 Kivu Provisional, 1 Liberia, 2 Lukoshi, 2 Nigeria, 4 North Katanga, 1 North-West Katanga, 2 Sierra Leone, 1 South Congo, 1 South-West Katanga, 1 Tanganyika/Tanzania, 1 West Zimbabwe, 1 Western Angola, and 1 Zambia Provisional. I don’t think this changes your overall point, but it does put in to a bit of perspective just how much power the South will have. They will actually be 31 of 77. Still the largest voice, but not a majority. Woah…you are right. I’m missing the Central Conferences on my list. Mind emailing that to me, Jared? You are right that it negates a bit of the majority rhetoric, but it’s still a large-and-in-charge voice. Not sure if the data is available in an easily accessible way, but I wonder how many Gen X and Milliennial laity and clergy were elected from each Jurisdiction? How about Boomers and the Silent? Many of the issues that people talk about in regard to the UMC seem to be generational. But are they? I know there is no silver bullet to “fixing” the problems of the UMC. But we might start with trying bring other voices to the table, as opposed to assuming we know what they would say. There is a lot of “speaking” on behalf of others going on. Thanks for your views and updates. Just two things stuck out that haven’t been a least partially responded to. 1. You clearly overestimate the size of the church outside of the SouthEastern and SouthCentral jurisdictions by finding your focus on those going to General Conference which isn’t directly proportional. Larger conferences start out clearly underrepresented at General Conference (http://methodistthinker.com/2011/01/13/gc-delegates-set-at-988-philippines-gains/) and those representing a majority of membership have far fewer than a majority of those sent to vote. 2. The fear mongering isn’t particularly helpful in bringing in the SBC. Do you see a sizable fundamentalist wing in the UM church? Even Asbury, which you seem to think is very conservative, goes out of its way to (very appropriately) affirm women in ministry and embraces modern methods of scholarship. A related side note to add though is that I’m fairly certain that the “insular” SBC is planting far more new churches than we United Methodists are and likely doing far more than we are in areas like Massachusetts, Maine and the Pacific Northwest to reach new people. I hope we join them in that effort and plant new “vital” churches in those regions that have trended most strongly away from the Christian faith. 1) Thats due to the way the system is set up as a mixture of proportional representation (larger conferences get more delegates) weighed with minimum representation (so that even the smallest AC gets one clergy, one laity vote). Because of that protection, there will never be completely fair representation, but one must ask if 3-4 votes for the Southern jurisdictions is worth excluding 3-4 votes from the West, Northeast, Philippines, Europe, etc, which are part of the mission fields of Methodism rather than the power base. 2) The parallel with the SBC wasn’t about substance of their arguments (excluding women will never happen in the UMC) but about the way how the power base was cemented in one subculture of America that then overwhelmed the other subcultures of its denomination. The parallel is not fearmongering but being watchful of what happened when a church got too overbalanced and the effect it has had over the long term. Perhaps an unintentional oversight on your part, but the primary beneficiary of that sort of move would be our growing churches in Africa. The primary movement would be from Europe and the Philippines to Africa. The West wouldn’t lose much and the Southeast wouldn’t gain much. I’m curious. How much voice, when such a thing is necessarily limited, do you believe the Western Jurisdiction should have? I am in favor of the proportional representation system with minimum delegates that we have now. We as a church originally had a senate (or something like it) until 2000 when we changed the delegate allotment to be more proportional. We don’t need to go back to that. But the reason for the “minimum delegates” is so that every AC has at least some voice at the table. The UMR piece talks about legislation to remove that protection. And the CTA plan has much less proportional representation at the top of the UMC (the oversight board) than the MFSA counter-plan. So we both value proportional representation, but I also value a minimum threshold where the diversity of the UMC has a voice, and I emphasize, a voice OF CONSEQUENCE, at the table. I’m outside the tribe now, so I don’t really have a horse in the race. However, if memory of things-now-irrelevant-to-me serves correctly, the basic organizational body of the UMC is the AC, not the Jurisdictional Conference. It makes me feel like your whole premise is moot. About a decade ago the Southeast Jurisdiction was able to change the prorate of representation from the number of clergy to the number of members in an annual conference–which gutted many delegations and inflated others. Membership is not verifiable–but the number or clergy is. From another metrics angle, if representation was based on those congregations that paid their apportionments in full, we would have far more delegates in the Western and Northeast Jurisdictions. Suddenly we would really have vital congregations grounded in global ministries! The Bishops’ proposals want metrics–paying apportionments should count! Don’t confuse a size issue (i.e. “only the strong survive”) with regionalism. This open letter is sponsored by large-church pastors — mega churches, if you will. The reason so many are in the south is because that’s where the UMC is largest right now. I’m not saying it’s fair as much I want to critique a hasty jump towards the idea that the CtA or the reform have a distinctly “southern” voice. I can also assure you that some of the biggest critics of the reform also reside here in the south. This is a mega church move as I see it. This post is right on! Ever since I first read the Call to Action legislation, I recognized that it is a power-play by mega-church pastors. 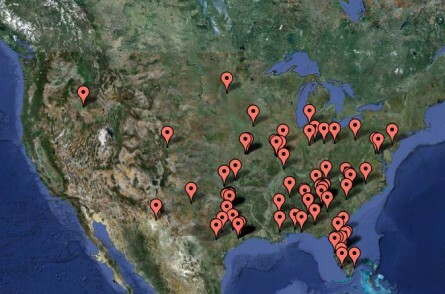 You will notice on your map the cluster of pins from Florida (my home conference). Two members of the IOT were from Florida, and we have ALREADY implemented this plan for church “renewal”. For many years our conference has received an apportionment for new church development. That office in Florida has a LOT of money to spend now. For many years that money WAS used to start suburban type churches that were destined to grow with new developments. Now the money is being designated to try to revitalize small churches. Jorge Acevedo’s church in Ft Myers is a prime example. 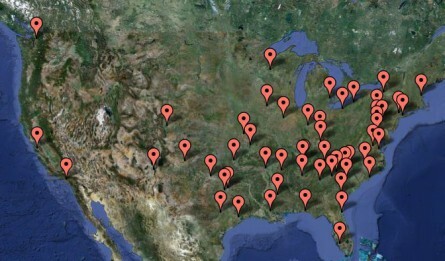 Grace UMC now has about 4 campuses. Two campuses are in small churches that were closed and then reopened with pastors chosen by Jorge (not the bishop). The church I attend in the Orlando area has outgrown it’s property. Last year we voted to take on the property of an inner city church that has struggled for many years. We hired a protege of our senior pastor. He is a seminary student who now as a “commissioned” pastor works part-time at our “new” site. Church development money is funding his 70K salary package! (Not bad for a part-time job.) The sad thing is, that we SHOULD have hired a bilingual or Hispanic pastor if we were interested in identifying with that new neighborhood. Instead, the good ol’ boy system prevailed, and the senior pastor got to choose a nice young man he wants to mentor. So this is the take-over plan. Small struggling churches with less than 125 average worship attendance, will be closed. Then a mega-church will step in and pour resources into redeveloping it. As a pastor who served small churches in the shadow of mega-churches, I used to BEG for assistance from them. I needed musicians, VBS leaders, bookeepers, etc. But resources were not shared. In fact, OUR resources were drained. They hired away the leaders WE developed and nurtured. This IS a power play by pastors who have sucked the life out of neighboring churches. This model will NOT work in many areas of our country, and is VERY Southern in flavor and origin. CTA is NOT a power play by the bishops. It IS a power play by mega-church pastors. It might be interesting (however difficult) to map out the additional signees beyond the original 87. That might speak to either a continued trend in the Southeast and South Central or it might say that there is more general and widespread acceptance. Yeah, that would be helpful, but would be really painful to map out. However, as I said, the letter is written in such a way that my progressive clergy friends are signing it too. When I first read the first few pages of the signatories, I wondered where are the women? Where are the people of color? Where are the people in the UMC who are frequently marginalized? Thanks for giving voice to this, Emily. In general, I like the CTA, but I am very concerned about the lack of female voices as originators on the petition (I spotted one in a cursory glance). It is a little tougherto identify minority voices just by reading names, but I suspect the same is true. I would love to have Jeremy turn his critical eye upon what is being pushed forward as “Plan B” – which does not eliminate that bothersome “General Board of Church and Society.” Both plans (as I can tell) downplay the role of those of color and women, but “Plan B” less than the IOT. I am a small church pastor in the South who feels rather marginalized. What is going to happen to my churches and the good people of these church if we don’t come “up to snuff” with all this? We are a denomination of small churches – we need something to celebrate that. Jeremy, thanks for a thoughtful post. Being in the West for the last 15 years I’ve learned that representation is a touchy issue and not an unimportant one. I appreciate your work. Great post. I’ve felt that many of the proposals are based on large churches and the underlining message is unsettling and seeing a breakdown of who is represented in the open letter and committees should alarm people. We should do more than give diversity lip service – we need to really live it in our church representation. Thanks for your post.Another aspect of the list of original signers is that it is comprised almost entirely of white men. Although one myself, I would be embarrassed to sign on to such a letter. Mr. Winkler, I shudder to think of the uproar that would ensue if you declared yourself “embarrassed” to sign onto a letter whose original signatories were almost all “women of color” or “Latino men” simply because of the race and gender. Why should white men be singled out in this way. As pastor of a racially diverse congregation located here in the supposedly reactionary south, please know the letter I signed has nothing to do with race and gender and everything to do with theology and stragegy. People of color, women and those marginalized will read your theology with an hermeneutic of suspicion. Not in the church I serve which is full of people of color and those whom society marginalizes. I must say that I am of two minds on this issue. On one hand, I appreciate your concern for ensuring that voices other than large churches are heard. On the other hand, when I think about who it is I want to be crafting the legislation that is going to move our church forward, I want it to be those people who have clearly had fruitful ministries. Now, bearing fruit is clearly not just about numbers, but numbers do say something! Oh John. You’ve fallen victim to one of the classic blunders! The most famous is “Never get involved in a land war in Asia!” Only slightly less well known is this: “Never respond with ridicule to reasonableness” as you are likely to get only more reasonableness in return…and then what do you do? Obviously, the idea that giving all power to the minority side of Methodism is problematic as well. To silence the successful voices would be open to as much ridicule as silencing the unsuccessful voices. The joy is that at the table, those who are in the “cutting edge” of Methodism as they seek to find novel ways to cut through the creeping secularism are side-by-side with those who have mastered their sections of Christendom that secularism hasn’t reached yet. They both need each other. What will happen when, like the folk tales and parables say, we have cut off the weakest links only to find they had what we needed at a later date? 1) Contrary to your opening paragraph about “answering reason with ridicule”, you do at least acknowledge in your second paragraph that there is reason in my reply not just ridicule (not that you agree with my reasoning, just acknowledge it is there.) Someone has said, “behind all good humor is some truth.” Humor is a rubber sword- it allows you to make a point without drawing blood. 2) Well, thanks for making my point by equating “Cutting Edge/Progressive” with “ineffective/unsuccessful” in your second paragraph. That pretty much should end the entire discussion. John, again, when you don’t have a reasonable reply, you rely on reduction to absurdity arguments. They are done well as intros and closers to the show, but when the show is also nonsensical, it leaves the audience unfulfilled. I would encourage you to look at my reply and show me where the words ‘progressive’ and ‘conservative’ are. In no response do I characterize the South as conservative (or bad) and the NE and W as progressive (or good). Rather, I emphasize that there are those who are “in the midst” of secularism and those whom it hasn’t reached yet. Both progressives and conservatives have been successful in both contexts, so it is silly to draw the lines along ideological lines. This is a strictly cultural discussion, and there are distinct cultures between them. My argument doesn’t rely on the tired progressive/conservative divide, or the even more tired progressives shrink churches/conservatives grow churches divide. Rather, it relies on the very reasonable affirmation that any global Methodist church needs the voices from the successful and growing areas to be in conversation with the struggling areas at the same table, not the successful at the top table, and the struggling at the kids table. There is plenty for both to learn from each other and keep the UMC relevant and transformative to the world across many contexts. I think you are now locked into a land war in Asia. So you absolutely have pinned this to a sectarian progressive/conservative argument. Your land war in Asia is that everyone who reads your blog can scroll back and see these things. You have tried to put a veneer of “south/large church” on your argument. But you have made it clear the basewood is progressive vs. conservative sectarianism. John, anyone can use CTRL-F to find the words on the page. It takes a bit more work to do the context. In the reference to the SBC (and my reply to comment #9 clarifies), it isn’t what the SBC did but how the concentration of power into a monoculture ended up with drastic changes for the whole of the denomination. Are we liable to remove women ministers? Of course not. So the parallel is the method and the context, not the theological slant. Your other two CTRL-F hits are incidental, unless you really think I make a causation between young and progressive, which in my experience is not at all the case. For the third post in a row, you’ve ignored the primary argument: That there’s a problem when a particular cultural context seeks to exclude outside voices. It’s not about theology or tired battle lines, it’s a cultural examination. Over and over, I’ve talked about how difficult it is for me to affirm that a single culture (even if the most successful) should seek to change the church so that mission field voices are left out. If you are not interested in talking about that, then it seems like our conversation has run its course. Blessings on the journey. It seems to me as if the concept of connectional church is being slowly eroded. The large churches deny needing any of the products and services provided by general agencies (and some are VERY good). It is the smaller (marginalized?) churches that will suffer. I agree with an earlier comment. This seems to be a power play by large church pastors. It’s disheartening to this all disintegrate into a power struggle. I trust the movement of the holy spirit will prevail. There is so much distrust – and a true lack of appreciation of tolerance and inclusivity – in these comments that it is embarrassing. Jim Winkler, you ought to know better. And Holly – this runs counter to the wonderful attitude and spirit that you usually have. To accuse mega-church pastors in the UMC of a power play is downright sinful and untrue. It is NOT a power play to want more people to know Jesus Christ, and for our church to structure itself so that we might do that more efficiently. I know several of these folks personally, and not only have their ministries been fruitful, they have had justice, inclusivity, and the poor at the forefront of every aspect of their ministries. We are all free to agree/disagree with Call to Action. But we are not free to make unfounded accusations against fellow Christians and United Methodists. Shame on us for acting this way. Any thoughts on the content of the blog post, Sky? Or contributions to the conversation about the content of the blog post? I couldn’t think of an appropriately tactful way to respond to those comments. You are successful here. Amen, Sky, Amen. Unity in Christ should be our hope and goal. The Call to Action appears to come from the question of How do we build strong healthy churches in the USA? Then how do we reduce the structure and budgets as we have in large US churches? General Conference is a global gathering, not a USA gathering. If we want assistance in the USA we might ask our global colleagues for their input, before we tell them what the answers are for the rest of the world. I have a hard time following the logic of hegemony in this particular situation; if you took the makeup of the originators of the document or the IOT, you’re going to find a lot broader theological and ideological diversity then you seem to imply. Also, just because a church is from one of the southern jurisdictions doesn’t mean it’s a cookie-cutter copy of the other. If you look at Church of the Resurrection in Kansas and Grace Church in Cape Coral, FL, you’re going to see two VASTLY different churches. Adam and Jorge are total opposites personality wise, and would differ on several theological/doctrinal issues. I’d also challenge you in your statement: “All boilerplate CTA stuff but worded in a way that even my skeptical young clergy friends are signing it.” That comes across as arrogant presumption. Aren’t your friends people of prayer who try to discern what God might be saying to them? I’d ask you, Jeremy: Any thoughts about the comments people are leaving in response to your article? Is this the reaction you wanted to have? Sky, thanks for your comments. There is a broad theological spectrum across this large swatch of United Methodism. There is a broad spectrum in any conference, be it the depths of Georgia or the outback in Maine. So clearly by comparing individual churches, any presumption of a unanimous theological or doctrinal assertion would be faulty. I think to your question, I was surprised at how the conversation has shifted from “culture” to “churches.” When I put the points on the map, they were to point out the sheer numerical strength of the Southern conferences and how they are increasingly representing a similar (not identical) culture within United Methodism. I didn’t intend for it to be focused on the actual churches and pastors, as some of the commentators have. Rather, the thrust of this argument is whether persons representing a monoculture of increasing size be the ones that exclude those who are in the mission fields of United Methodism. Do they have the right to “fair representation” to more delegates at GC? Sure. But ought they exclude the very voices of the churches and cultures we are called to preach Jesus with? I don’t think so. And I see, and have outlined, the various ways where our legislation would exclude the mission fields of American United Methodism. I say this as someone who has grown up in the south, served 6 years in ministerial capacities outside of the south, and came back with a more critical eye for cultural differences. While that doesn’t compare to your ministerial experience, I say it to explain that I have left a culture that was my own, lived away from it, and then returned with an eye of critical experience, not naive theory. Jeremy, your headline might have something to do with inviting a move from “culture” to “churches.” I know I’ve written posts where the comments ended up someplace else than I expected and discovered on reflection I led folks that way. With your alertness and concern for diversity, though, I think you would also have an appreciation for differences in culture within regions. Florida has several different cultural zones itself. Atlanta and Dallas have more in common, than Atlanta and Valdosta. I get that the West and the South are different, but most people who live in the deep South would not consider Oklahoma the South at all. I find the most disturbing portion of the connectional table legislation is that fact that it places all assets of all agencies under the control of 15 people. We are top-heavy – that isn’t the issue. It’s how we remove layers of unnecessary structure without destroying the heart and the mission of the UMC. I am wary of placing the control of that much money under that few people. I am also concerned that the General Commission on Religion and Race and General Commission on the Status and Role of Women are completely dissolved by the connectional table legislation (or so it appears to me)- Plan B would place them under the General Board of Church and Society – a much better compromise IMHO. I don’t think monitoring agencies (GCORR or COSROW) should go under any center or board. Then, how can they objectively monitor their own board? Better to keep them separate commissions. IMO. I have been aware for a while in the way the UMCom has approached the issue, that is a bit concerning. UMCom has taken the role of Advocacy for this issue at General Conference as opposed to information on both sides. That has metered a bit, but still a concern. And that concern comes from the essence of the article: does the Spirit of God call us fro this type of Administrative shift that has far reaching of effects without looking at it from all sides? Since the mega-church pastors think it’s great for the church, are we just supposed to affirm it? Are we really open to critically challenge the entire structure, including mission funds from US churches to Central Conference Churches? Where is the accountability of the local church in developing the type of connectionalism that will create the growth we seek? What is the role of the DS in supporting the work of the local pastor in successfully fulfilling her/his call to ministry? This is the future of the church. None of the mega-church pastors will be asked to move; they will determine their own fates. What happens to the order of elders and the office of elder in the church in general without guarantee of appointment? What happens to the itinerancy? Looking at these questions is not the answer, but some questions must be raised lest we simply assume that administrative decisions become the heart of ministry in the UMC. 1. Very, very few of our laity have “guaranteed employment.” This has often had the effect of many seeing an entitlement to a vocation that is supposed to be giving an example of trust, faith, and sacrifice. 2. The actuaries are beginning to show that congregational decline may surpass clergy retirement (since more clergy are retiring at 72 instead of 65, and the retirement age may continue to go up). What happens when an annual conference has more clergy with guarantee of appointment than it can appoint? If you think that can’t happen, it happened in North Carolina a few years ago, and there is always a line of clergy in North Georgia and Florida who are deferred in the ordination process “pending appointment.” The only solution I know (besides congregations starting to grow again) is to lower or do away with a minimum salary. I don’t think the itineracy falls apart without guaranteed appointment. But it may be a luxury we can no longer afford.